I've been playing music since I was ten years old, first the trumpet and later the guitar. Although I can teach a variety of genres, my passions include fingerstyle folk and jazz. I'm especially influenced by Adam Rafferty, Stephan Wrembel, Louis Armstrong, and John Coltrane. I believe that if learning guitar is ever frustrating or unwelcoming to the student, the teacher has to take a different approach. My vision is simple: help the next generation express themselves through music. I have been playing guitar for nearly 15 years now. As a youngster, I also took guitar lessons, learning theory and lots of pop and rock songs. Nowadays, I'm more of a Soul, Jazz, Hip Hop, Indie, influenced guitarist. My favorite artists range from the Beatles, Stevie Wonder, John Coltrane, J Dilla, D'angelo, to Iron Maiden. I love to teach! I make fun my top priority, and I want students to always walk away with a positive impression of music. I pride myself on being informative and direct while remaining very patient and relaxed. with a focus on folk and rock. and Paul Simon, but I can get into pretty much anything with a good riff! excited about picking up the guitar. I've been playing guitar for 13 years and giving lessons for the past 6 years. My main influences are blues, funk, jazz, and rock. Some guitarists I've been digging recently are: Isaiah Mitchell, Cory Wong, Julian Lage and Marcus King. I emphasize learning many songs, developing good technique for a clear tone, and fostering a strong foundation of playing in time. This prepares students for playing in a band or as a solo performer. I especially enjoy helping beginning students. I love teaching a bunch of styles - jazz, folk, rock, pop, funk. We'll make learning the guitar fun and rewarding! I found an affinity for playing acoustic guitar when I was 14. Continuing to take piano lessons through my teen years, I taught myself guitar with Pete Townshend, The Beatles, and Paul Simon in the foreground for inspiration. Learning these songs and stylings of inspiring musicians has been most resourceful for discovering what resonates with me. Now in my third year studying jazz guitar and music composition at Portland State, my musical inspirations and interests have expanded greatly (Gilad Hekselman is a favorite guitarist). Improvisation and songwriting are my two strongest interests now. I still recognize musical vocabulary coming out of me in improvisation and writing from those beginning guitar years. I'm eager to teach the technique, theory and songs that will help uncover and enjoy what is musically resonating in those early years. 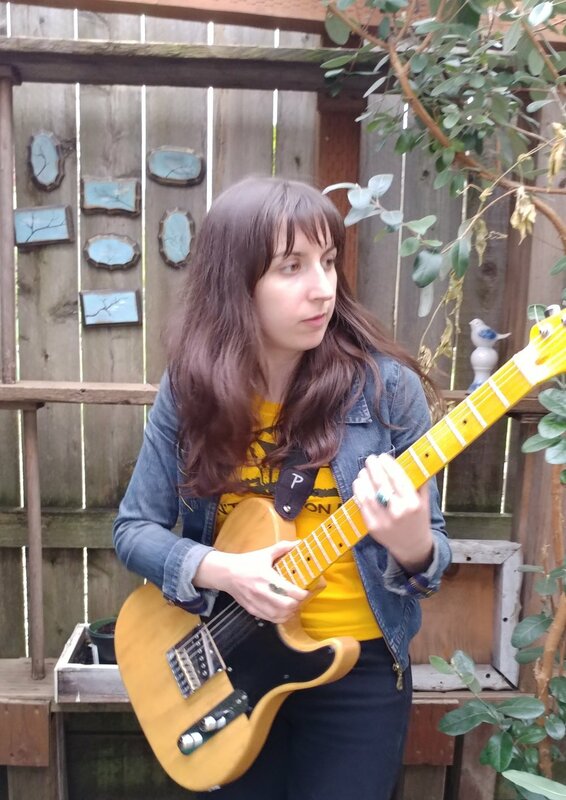 I am a guitarist, pianist, bassist, composer and songwriter native to Portland. I began performing at 15 with my high school band in venues like the Hawthorne Theater and now defunct Satyricon. I am a graduate of Portland State's College of the Arts with a Bachelor's degree in Music Composition with Jazz Guitar focus. I am also a frequent performer in the Portland music community where I play a variety of instruments and styles. 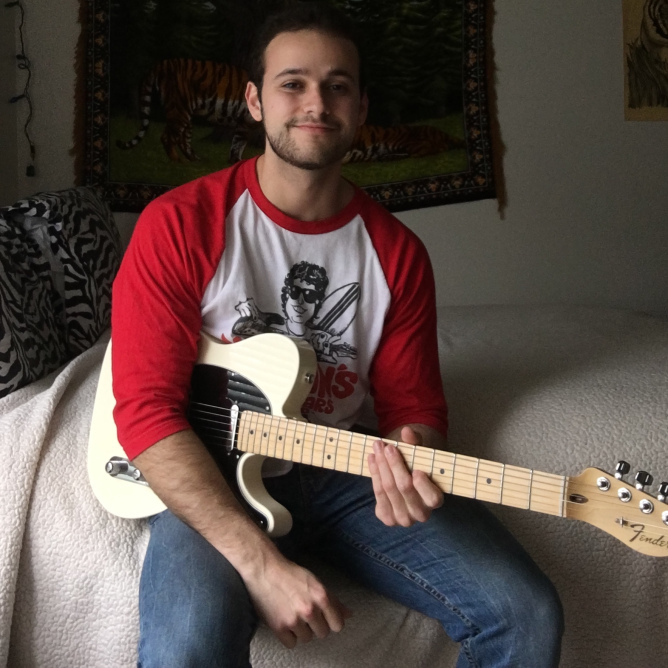 With experience in rock, jazz, folk, country, and pop, I can help your student achieve their musical goals regardless of age or experience level. a few records, written a lot of songs, and toured around the U.S. and beyond. sharing what I’ve learned with others. I think learning guitar should be fun and I work hard to make sure lessons are a good time. I focus on teaching students what they want to know so they can saywhat they want through music. I grew up in the suburbs of metropolitan Detroit, MI. During my childhood, I was always interested in many different things, such as drawing, skateboarding, basketball, and writing. When I turned 13, I got my first guitar and began lessons. This instrument changed my life, and I knew I found my calling. Over the years, I continued taking lessons, playing with friends, writing songs, giving lessons, and eventually playing in bands while in school. I went to college in Grand Rapids, MI and graduated with a bachelor's degree in psychology. During this time, I worked as a substitute teacher in special-ed classrooms, where I learned that effective communication begins with effective listening. I’m very grateful for this, and the host of other lessons I’ve learned from teaching. My longtime friends invited me to join their band in Portland and tour around the U.S., so I decided to make the move. Since then, I've made many new friends in the music scene, and I continue to learn from all the wonderful, talented people in this city.